Mozambique army 'raped my neighbour' Jump to media player More than 6,000 people have fled Mozambique to neighbouring Malawi after being caught up in fighting in the north of the country. Years of work for 'mine-free' future Jump to media player Success for Scottish-based charity the Halo Trust as Mozambique declares itself officially "mine-free". African refugees who call America's whitest state home Jump to media player More than 6,000 Somali Bantus and ethnic Somalis have made Lewiston, Maine, their home over the past decade. Matt Danzico reports on how both communities have dealt with the dramatic change. The rebirth of a wildlife park Jump to media player After being almost destroyed in Mozambique's civil war, the country's Gorongosa National Park is once again becoming a draw for tourists thanks to a dedicated investment programme. 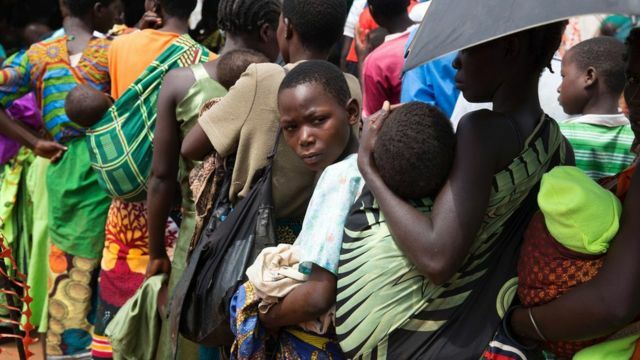 More than 6,000 people have fled Mozambique to neighbouring Malawi after being caught up in fighting in the north of the country. Government forces are accused of targeting villages loyal to the opposition, who have threatened to seize key areas after the 2014 elections which they claim were flawed. Karen Allen reports from Malawi.